Under the catch-all word “shoddy,” unscrupulous manufacturers sold the Federal government poor uniforms, guns that didn’t shoot, and ill-fitting shoes. “For sugar the government often got sand; for coffee, rye; for leather, something no better than brown paper; for sound horses and mules, spavined beasts and dying donkeys; and for serviceable muskets and pistols, the experimental failures of sanguine inventors, or the refuse of shops and foreign armories.” So wrote Harper’s Monthly journalist Robert Tomes in July 1864. What Tomes was describing was far from uncommon during the American Civil War, a war that many have put on high moral ground beneath the umbrella of righteousness. But in that war, as with most wars throughout history, thievery and corruption ran rampant. This corruption, involving not only suppliers and manufacturers in the North but also high government officials, resulted in the unnecessary loss of life for many Union soldiers and was so costly as to prolong the war many months after it might have come to an end. Corruption in all forms was familiar to Americans long before the Civil War. The struggle with corruption can be seen in one of the earliest debates surrounding Alexander Hamilton’s economic policies, particularly his views on the need for increased manufacturing. Many common people feared that new economic policies would be the basis for systematic corruption. Southerners, especially, were wary of an industrialized manufacturing society and centralized government itself. Although the idea of popular sovereignty was favored by many Americans, the susceptibility of the people to be controlled by a demagogue made Clay and other politicians uneasy. By the mid-1850s, corruption had spread even into the lowest political levels. “Congress is a humbug and Washington is no place for an honest man,” Benjamin French wrote in 1853 of his fellow United States representatives. Bribery and self-interest were commonplace in Washington, and French was one of the few officials who cared about the issues that were forming the nation rather than the personal rewards of his actions. Corruption would have a large and deleterious impact on the Union war effort. At the beginning of the war, thousands of new soldiers had to be supplied, leaders had to be appointed, and some form of military organization had to be established. In many wars, an economic boom can follow the sudden need for material and labor. The Civil War was no exception. The railroad system was already on the rise due to its advantages over existing canals, but the Civil War would take railroad usage to another level. A more humble industry that prospered during the war was the lamp oil industry. 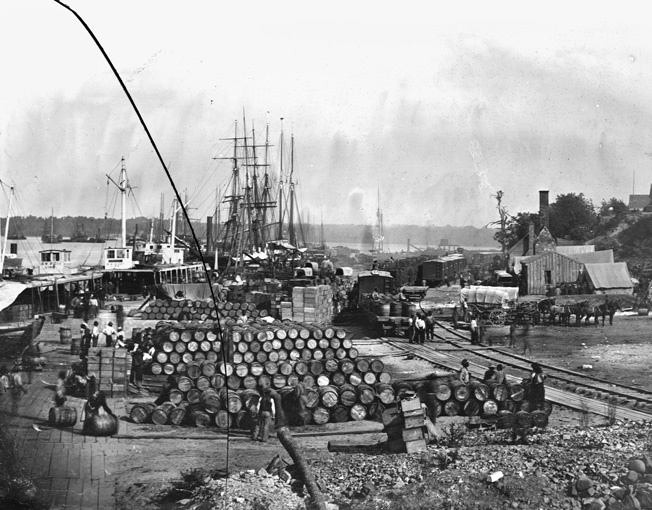 A vast mound of military supplies is unloaded at the major Union Army depot at City Point, Va., during the 1864 siege of Petersburg. By then, improvements instituted by Montgomery Meigs had gone into effect. The institutions that were most vulnerable to corruption during the war were those with the responsibility of supplying Union armies in the field. As ordnance and munitions contracts poured out of Washington, production of iron, brass, and bronze weapons proceeded at record levels. Many of the metal foundries were also put to use making rails for the emerging railways. Uniforms, blankets, tents, oil cloth, wagons, chemicals, and ships were all in high demand, and there were plenty of willing men in the North to fill the orders. What Northern manufacturers lost from their Southern markets they more than made up for through government contracts. The loss of Southern markets did have an impact on the textile industry of the North, since other means of acquiring cotton were necessary. These contracts not only provided commerce for small Northern companies, but also opened up the national market. 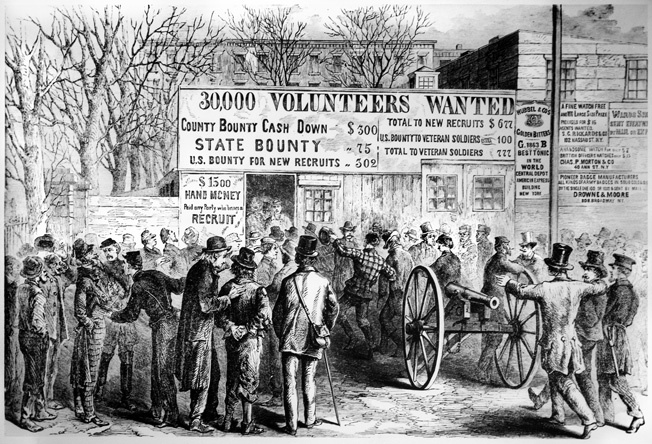 Volunteers throng to a Union recruiting office at the beginning of the war. Many of these same volunteers would receive ill-fitting uniforms, flimsy-soled shoes and misfiring weapons from unscrupulous government manufacturers. In the sprint to supply the first volunteer soldiers, many less than acceptable products were sold to the government. Although many of the poorer quality items were passed because of sheer haste or carelessness, many more were okayed due to the bribery of government officials at every level. Large contractors would take the high-priced orders they received from the federal government and subcontract them to smaller companies for lesser prices, still making a large profit without actually producing any goods themselves. For example, the Sibley, Tyler, Laugham and Dyer Company was offered a contract of eight cents per pound of cattle, which it then subcontracted to Williams and Alerton for six and a half cents per pound, making a profit of more then $32,000 without moving a single head of cattle. Many high government officials, including Maj. Gen. John C. Fremont, head inspector George Updyke, and Secretary of War Simon Cameron, were later exposed for allowing or encouraging this sort of behavior, but dozens of lesser officials partook in the thievery unmolested. The New York-based company Brooks Brothers produced pocketless, buttonless, and overall inferior-quality pants but somehow still received a government contact to do so. Even rejection did not sway contractors from their dealings. An arms manufacturer once bribed a government official with $10,000 to approve a pistol that shortly beforehand had been deemed unfit for service by the chief of ordnance. Secretary of War Simon Cameron. The federal government was cheated on many types of items. In September 1861, Fremont commissioned a fort to be built in St. Louis. The majority of the fort had already been built, but a separate builder received $150,000 for the seven days of work that it took to complete the fort. Quartermaster General Robert Allen was able to catch the closing stages of this deceit and stop another $60,000 from being paid. Animals were also the subject of corruption. The government once bought 411 horses from contractors in St. Louis—76 were in working condition, but all but five were too sick, worn out, or old to be used. The other five were already dead. Another $40,000 was lost on the transaction. 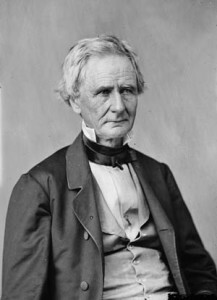 Secretary of War Cameron played a large part in crippling the Union war effort. He commissioned his good friend Alexander Cummings, whom he described as “a capital man,” to buy supplies for the War Department. Cummings did purchase some military-related items, including completely unserviceable carbines for $15 apiece, but he also spent more than $21,000 on such debatable items as herring, porter, ale, straw hats, linen pantaloons, and 23 barrels of pickles for the soldiers. Union supply trains were often needlessly rerouted through Cameron’s home state of Pennsylvania on the flimsiest of excuses, further lining the pockets of his political allies. Individual Northern states attempted to take up much of the slack left by the inefficient national government. State legislatures appropriated funds to equip and supply regiments at state expense, and governors sent private purchasing agents to Europe to bid for surplus arms. Contracts were made with local textile mills and shoe factories for better uniforms and shoes. Neither the citizens back home nor the government in Washington were completely oblivious to the fraudulent practices. After Lincoln summarily got rid of Cameron, shipping him off almost literally to Siberia by making him ambassador to Russia, a special Congressional committee was organized to investigate the government’s dealings with private contractors. This committee found that the Colt firearms company was selling revolvers for $25, while the normal asking price was less than $15, providing the company with a tidy profit of $325,000 in one year alone. At the same time, Remington was producing a more or less equal quality revolver for $15, but received only one-sixth the of the volume of government orders that Colt enjoyed. By the end of the committee’s investigation, it was estimated that fully one-fourth of the government’s spending had been lost to fraud. The blame was hard to place, however. The inspectors blamed the contractors for providing false samples, while the contractors claimed the samples were genuine and blamed the inspectors for approving them in the first place. But even if there wasn’t always someone specific to take the blame, there were still consequences. Eventually, much of the corruption ended after the removal of Cameron and the subsequent appointment of Edwin M. Stanton as secretary of war. Stricter regulations were put in place for approving government contracts, and canny contractors had to adjust their dealings in light of the changed circumstances. 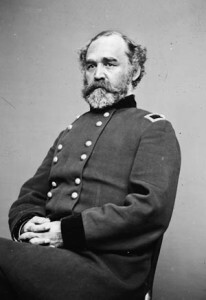 Stanton chose a new and industrious quartermaster general, Montgomery C. Meigs, who before the war had overseen a number of large government construction projects, including the building of the new Capitol dome and the Potomac Aqueduct. Meigs immediately instituted a system of competitive bidding, while administering the outlay of some $1.5 billion—one third of the government’s entire war budget. Union Quartermaster General Montgomery Meigs. Corruption, of course, did not stop altogether because of the new measures, but it was severely limited. Later in the war, under the new regulations, a few contractors tried to make money off the government by changing the ratio of corn to oats in horse feed. Assistant Secretaries of War Charles Dana and Peter Watson caught the practice and were able to put an end to the misconduct, saving the government more than $60,000 in feed costs. 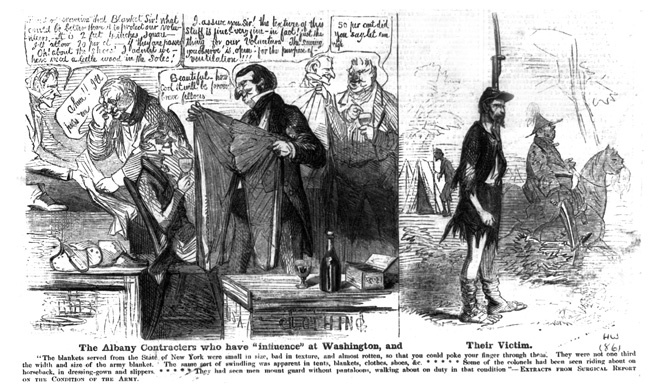 An 1861 cartoon shows chiseling Albany contractors selling shoddy clothes to corrupt government agents. A Union soldier stands guard in rags—an exaggeration, but not much. Eventually, all Union troops would receive the traditional blue trousers and coats. The government-issued uniforms were known to be of inferior quality. When it came time to trade in their state uniforms, many units refused. During the First Battle of Bull Run, several units came under fire from their fellow Union soldiers because they were wearing gray uniforms. A similar situation was present at the Battle of Cheat Mountain, when Ohio troops killed or wounded several Indiana soldiers due to a case of mistaken identity. 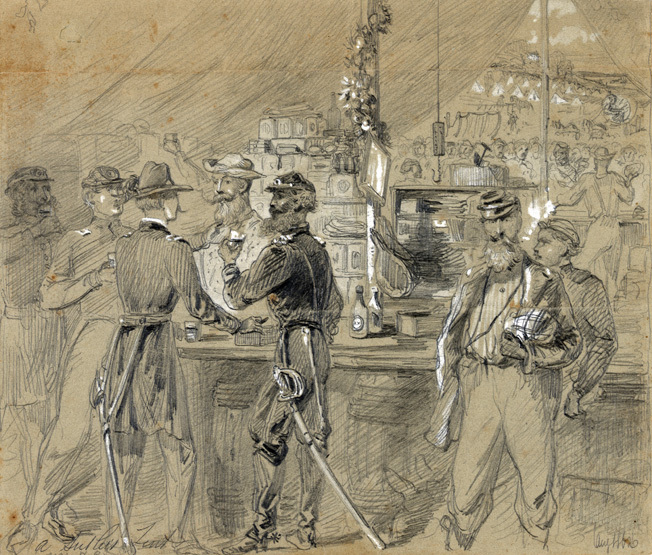 Union officers belly up to the bar inside a sutler’s tent at the front. Shoddy uniforms and supplies often forced soldiers to pay inflated prices from civilian sutlers for such basic necessities as food and drink. During the first months of the war, while the federal government was struggling to supply its recruits with weapons, it resorted to buying outdated Austrian models, flintlock muskets, or Belgian rifles instead of the higher quality Springfield or English-made Enfield rifles. Some soldiers deserted rather than go into battle with such arms. Others stayed faithful and paid the ultimate cost for their fidelity. When a piece of equipment would break, the cost of repairing or replacing the piece would come out of a soldier’s pay. For some this meant not being able to send money back home to support their loved ones. When the men were given food that had spoiled long before the government even bought it, they would either starve or, like with their clothing, pay privately for extra food. 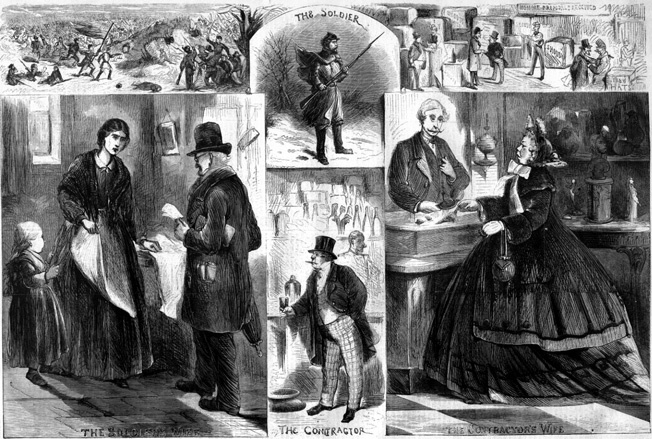 Satirizing the situation, a cartoon in Harper’s Weekly portrayed a fat contractor and a ragged soldier. The contractor asks the soldier: “Want beefsteak?” The soldier replies: “Good gracious! What is the world coming to? Why my good fellow, if I get beefsteak, how on earth are contractors to live? Tell me that.” The answer was implied. 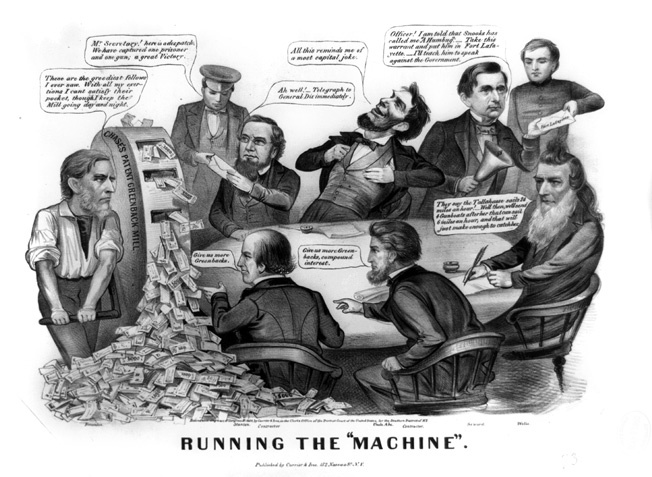 An 1864 cartoon depicts an incompetent Abraham Lincoln and his cabinet carelessly “running the machine” of the nation’s war effort. Sutlers’ supplies fell into two general categories, “necessaries” and “non-necessaries.” The first category meant primarily clothing and food, including replacement articles of official clothing and such non-essential articles as shoestrings, suspenders, gloves, extra socks, and handkerchiefs. There was a lengthy and comical debate about whether tobacco constituted a necessary or unnecessary item. Many Union doctors sided with the smokers, believing that the smoke from cigars and pipes helped keep down mosquitoes and malaria and was also useful in treating diarrhea and chronic fatigue. Congress, in its considered wisdom, refused to approve an official tobacco ration. Accordingly, all sutlers carried pipes, chewing tobacco, cigars, snuff, papers, and matches. A plug of tobacco could cost as much as a half-month’s pay. Food items varied at different times and locations but generally included fresh and preserved fruit, fresh and smoked meat, crackers, coffee, molasses, rice, potatoes, cheese, and butter. Also ruled essential, at least early in the war, was the sale of intoxicating beverages, whose medicinal purposes were highly touted by the soldiers. Patent medicines were also carried, sporting such colorful names as Carminative Balsam (“a cure for every ill known to man”) and Redding’s Russia Salve, which claimed to be equally effective for consumption and foot itch. Perhaps the most tangible effect that corrupt business practices had during the Civil War was the extreme loss of money the government suffered because of the widespread fraud. It was later determined that fully one-fourth of the government’s spending had been lost through fraud. In the first year of the war alone, $50 million was spent for general sustenance of the soldiers, and another $50 million for quartermaster’s supplies, where much of the corruption occurred. By the end of the war, those figures had risen to $369 million and $678 million, respectively. With the cost of moving and packing all these supplies, the various branches of government spent approximately $750 million dollars during the war. A great portion of that money was handed over to unscrupulous contractors. The plight of the soldier and his hard-pressed family is contrasted with the relative comforts of a government contractor and his wife. “There was never so glorious a cause so poorly served, so utterly ruined through the instrumentality in about equal degrees of incompetence and knavery,” said Massachusetts Senator Henry Dawes. It seems like a fair assessment. While a contractor raising the price of his caps an extra couple of dollars did not have nearly as much impact on the war as the battlefield ineptitude of Maj. Gen. George McClellan, economic corruption did affect the way the war was carried out. And as with all wars, it was the common soldier who suffered the greatest consequences and ultimately paid the highest price. Tags Abraham Lincoln, Alexander Hamilton, Andrew Jackson, Battle of Bull Run, Charles Dana, Confederacy, John C. Frémont, Simon Cameron, Ulysses S. Grant, Union Army, Zouave.